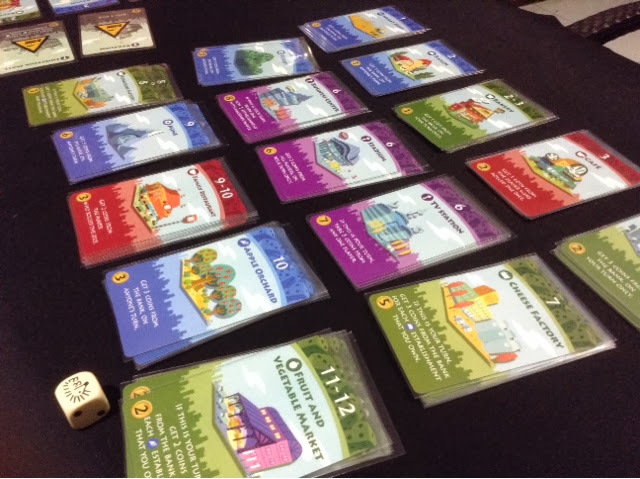 In Machi Koro, players are trying to build up their town with a selection of buildings that, with some luck, will help to generate enough money for them to be the first to build their 4 landmarks. This will signal the end of the game and that player will be declared the best major of them all. Each player starts with the same 2 basic buildings which help them to generate income whenever the right value appears on a die roll. What happens each turn is very simple, the active player will first roll a die ( or two dice if they have built a particular landmark ). From whatever value that appears on the die, each player may be able to collect money during and even out of their turn. Some buildings also allow players to steal money from the player who rolled the dice. Once these effects have been settled, the active player is able to either buy a building from a selection of 15 buildings or he/she may be able to build 1 of their 4 landmarks. The buildings help the player to generate more money from the dice rolls while the landmarks provide in-game ongoing abilities for the player. The game ends once a player has built all 4 landmarks. The buildings in Machi Koro is what really makes the game different and interesting. Each building has one or two specified numbers in which, when rolled, will help the player to generate money. The color of the buildings and the wording on it will inform the player if he/she will be able to collect the money during their turn, during anyone's turn, or from the active player. The blue buildings allow collection during anyone's turn, the green and purple buildings allow collection during your turn only, and the red buildings mean you will collect money from the active player. Machi Koro has really simplistic gameplay. This does not mean that the game is without wonder or excitement. On the contrary - for some reason I cannot explain - there is such a draw about rolling a die or two and shouting for a result that favors you in a big way. 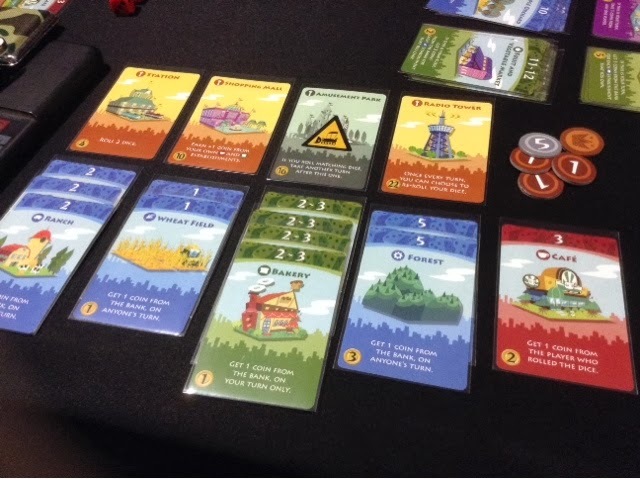 In essence, Machi Koro is an engine building game with a push your luck element in it. You can diversify and increase your chances for successful rolls, or you can bet your house on a few numbers and roll away in deep prayer and/or frustration. The buildings also have some combos in them whereby some of the higher numbered buildings allow you to collect more money for each of the smaller buildings you have. So with proper planning you can try to set yourself up for this chain of money influx. Try is the word as everything relies on the die roll. Which may either immediately turn you off the game or make you go into it with the right mindset. And I hope that it would be indeed the latter as it would be a shame to miss out on what Machi Koro offers despite and in spite of its luck dependence. The dice will roll its own way with the only means to influence them is by building the most expensive landmark ( you may build the landmarks out of sequence ) which then allows you to reroll the dice once. That's about the only way to influence or change the dice rolls. So you will have to know that going in. After my first play of Machi Koro, I liked it for its cute art and simple yet very nice gameplay. But on my second play, my enjoyment of it just went even higher. I'm not sure if it's because of the group I played it with or maybe it was how close our game was ( each of us just needed the right number to jump to victory ), but after my second play I was very delighted and won over with its light hearted-ness and its approachability. There were many smiles and cheers over the table for the die to turn the tide in each other's favor and many a curses for an opportunity gone and wasted. There is some direct conflict in the game via stealing from others and it can slow the game down a little, but it's easily mitigated with proper building investments. I wish I could better explain the draw of Machi Koro. The decisions are decidedly simple, you'll just have to choose what building you would like to buy. I feel that the fun of the game comes from building your own town and the anticipation of the die roll results. You never really feel like you're out of the game as you will instead feel that the next building and the next roll will change your luck and your life ( drastic and very drama I know ). It's just so well woven together that it brings a certain child like hope and anticipation with each new game. It will be greatly appreciated !! 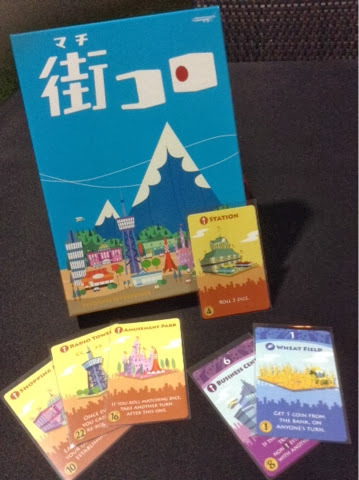 Is this game good enough for you to recommend getting the japanese version (with the machi koro plus)? I do read a bit of Japanese but my friends don't. Though I can always print out player aids from BGG (not a big fan of paste ups tho lol). I will be in Japan so I would be looking out for this but want to get some recommendations for this game before I dive right in. as for whether the base game itself is worth the time and effort for paste ups, well, if your group can appreciate light hearted luck based games, then i think its a good game for a filler for 30mins or so.